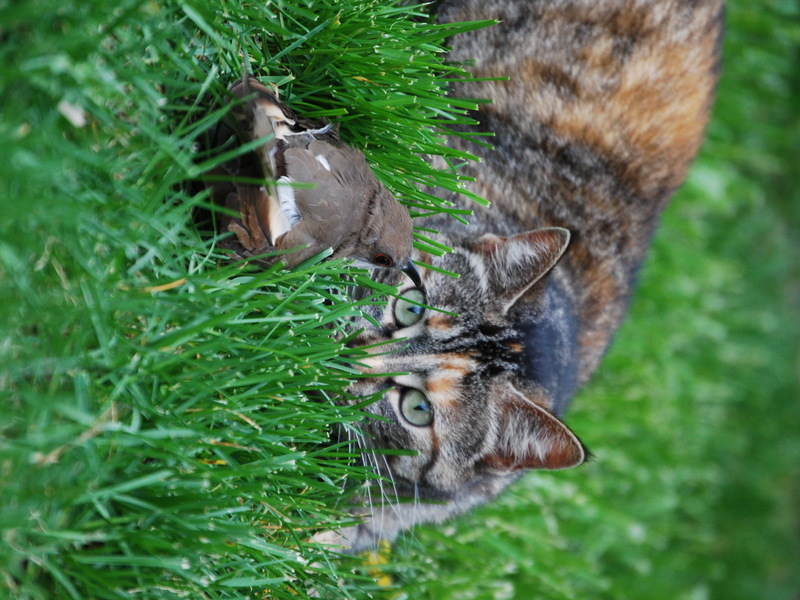 In May of this year, I photographed our cat, Twila, stalking a bird in our yard. Although Twila is a great “mouser,” she tends to be gentle with birds. She plays with them (similar to the way she plays with spiders), and then lets them go. This bird was no exception. Thirty minutes after I took the photo, I saw the bird perched in a nearby tree. No longer interested in playing with the bird, Twila moved on to stalking bigger and better things, including a squirrel. But unlike the birds, squirrels in our neighborhood refuse to play with her. She gets the same response from the raccoons. Twila is a special cat – very wise, respecting spiders, and gentle, observing birds. According to Buddhism, she could be a Buddha, manifesting as a cat for the benefit of other animals. Lovely phot. Excellent photo. Our cat plays with a border collie like some kind of mountain lion at times. And of course the fun You Tube “owl and cat” playing at http://www.youtube.com/watch?v=8WxDsNe6Hk8 . Thanks, Phil. I was not aware of the “owl and cat” video. I’m trying to imagine your cat playing with your collie “like some kind of mountain lion.” Too funny. Thanks again!